this is a456: That's Some Pig!!!! (On the architectural significance of the pig). At a review this past Friday, I was admiring a student project that placed pigs and humans in close quarters. This lead to some excessive ruminations on the iconography of the everyday pig. For another class, Emily Thompson remarked that pigs were the "SUV's" of preindustrial society. Pigs were on the brain. 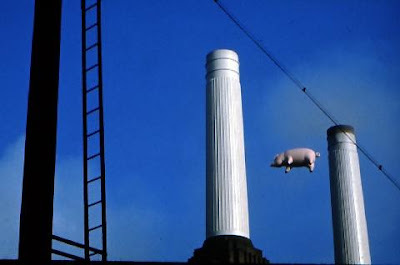 But while considering the student project, I remarked that the greatest statement concerning the architectural significance of the pig comes not from a designer, but from Pink Floyd. Yes, that Pink Floyd. I was remarking specifically on the cover to the band's 1977 album, Animals. 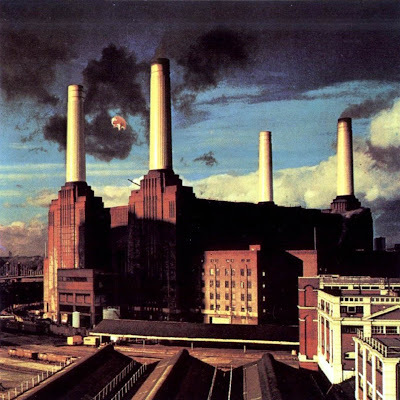 The cover art features a giant, inflatable pig flying through the smoke stacks of Sir Giles Gilbert Scott's Battersea Power Station. 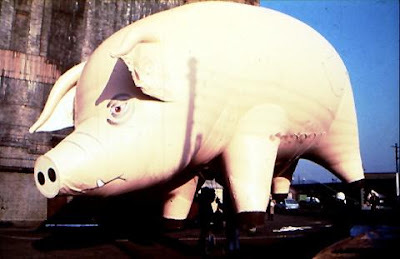 According to Pink Floyd's website, the inflatable pig was launched during the album cover photoshoot, in 1976. A marksman was on hand to shoot the pig in case it broke free from its moorings. 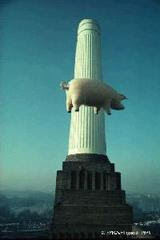 On the second day of shooting, the pig did become unmoored, and flew onto incoming Heathrow traffic, causing delays. Heathrow control tracked the pig up to an altitude of 18,000ft, asking all traffic to be aware of a giant pig flying in the area. The pig eventually landed gently on a pasture. Pink Floyd's pig is heavyhanded symbolism. Animals was famously inspired by George Orwell's Animal Farm, and thus the pig is associated with control (Pig="Pig"=Police). But the image of a pristine, plump pig flying in between Battersea's massive cooling towers ... one would not be surprised to hear Raymond Williams or Leo Marx invoked. And the latter is especially poignant, as Animals tracks the reintroduction of the garden into the machine. The environmental planning of an age is not neutral ... rather it is the expression of the prevailing attitudes, and when in existence it reinforces those attitudes by structuring the basic elements (house, street, city landscape) from which we infer the structure of the whole. One of the main festures of the present environmental design programme is a monumental rigidity which precludes any significant role or identity of the user. It is the same third-rate democracy as the political structure as a whole ... the range of freedom given (voting and furniture) is demeaning. To counteract this and again indicate to every individual his capacities as architect of the totality, an alternative form of environmental situation is envisioned which is in itself as undetermined as possible, depending for its life and forms on participant action and invention. Pneumatics seem at this moment to be one of the mose useful means of realizing this programme. But not as a futuristic fantasy on paper, but as an event in operation now, confronting the institutional monolith in its midst (1969: n.p.). Indeed, for Shaw, the rock concert and the flying inflatable pig may as well be indicative of a "particular structuring of art/architecture/spectacle/technology" that "makes operational an expanded arena of will and action open to everyone" (1969: n.p.). Yet the pig's delicate slalom among the power station's slender towers remind us of a different type of inflatable spectacle. From 1915 to 1916, the Marine Luftschiff Abeitlung (Naval Airship Unit) introduced the new L20-type Zeppelin to bomb Allied land and sea targets. L20's were the largest airships of their day -- they were 163.5 meters long and 21.7 meters in diameter, and could carry a payload of about 16,000 kilograms (around 16 tons). On January 31, 1916, nine L20's under the command of Korvettenkäpitan (Commander) Peter Strasser set out for a nighttime assault on Liverpool. The weather conditions were poor along the English coast, and through a series of navigational errors, the assault fleet ended up lumbering over East Anglia. The L14, commanded by Kapitänleutnant (Lieutenant Commander) Alois Boecker, started attacking targets in Tammworth, Overseal, and Swadlincote, with little effect. He turned the L14 towards Darby, and hit several high-profile targets with high-explosive and incendiary bombs: the Rolls-Royce Factory and Testing Track, the Metallite Lamp works, the Midland Railway's Carriage and Wagon Works, a lace factory, as well as some open sites and minor industrial buildings. According to a 2001 article from the Derby Evening Telegraph, the casualties amounted to 61 dead and 101 injured. In nearby Scunthorpe, results from the same air raid tell that the victims included "three people and a pig." Hi I draw a parallel between centre point and pink floyds another brick in the wall in terms of music and architecture and found this one interesting, as yes pink floyd have a pretty strong association with battersea power station already!